Are you aware of the Google’s Mobile pop-up penalty? You need to know about the Mobile pop-up penalty if you own a website. As scheduled, Google began to roll out its intrusive mobile pop-up penalty. The update is aimed at reducing the spread of those pages in Google’s Mobile SERPs, that use overlapping pop-ups or interstitials on the main content of the pages. Google aims at preserving the positive user experience of the users on its search results. And that’s a fact too. When searchers click on a search result, they hope to find out a relevant page that fulfills their need. The pop-ups or interstitials that are shown to the users before the main content just degrade the user experience and force the user to bounce back. On the whole, the referrer- Google is blamed for it. Since Google has made it already clear that it is not going to compromise its user experience at any cost, the Mobile pop-up penalty is being considered as a major step after the notification of mobile first indexing. Did you check your website for interstitials? 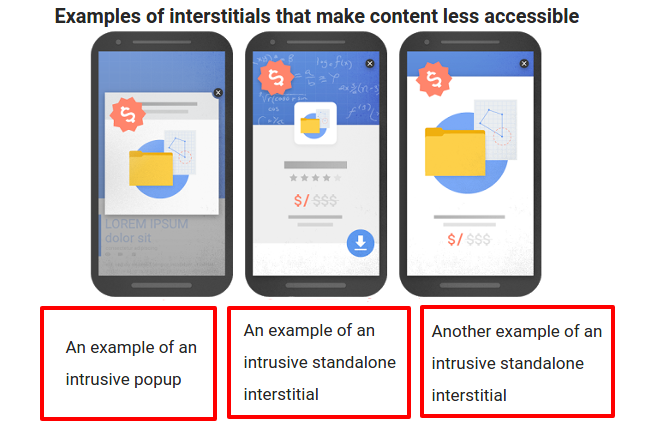 Print from the Google’s post to show the interstitials that are liable to penalty. 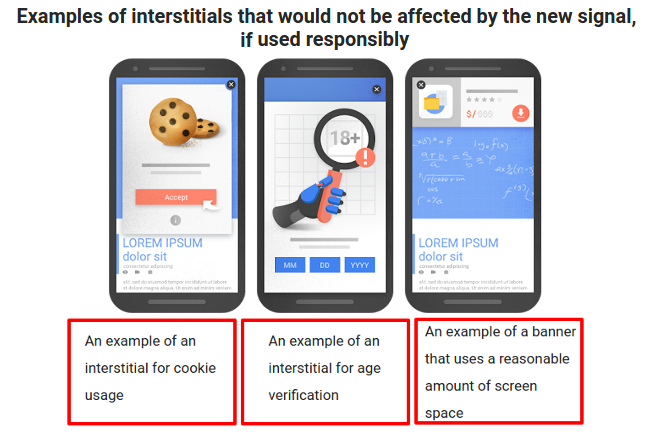 Print from Google’s post explaining the interstitials that are not liable to penalty. It is clear now that the penalty is liable to be imposed on those pages who use interstitials to overlap the main content and degrades the user experience. The new signal is one of the 200 signals of Google. The rest other signals will still be in action so, you have to be aware of all those signals before considering the Mobile pop-up penalty as the reason for your downgrade in Google ranking. With a responsible sense, you can still use some genuine interstitials as explained in above section. So, you need not worry if you believe in sticking to the rules and fair play. Lot’s of hoax has been seen in the past few days after the release of this update. Some say, it’s still in rolling phase and some say they have already been hit by the update. Still, this is too early to judge anything. However, it is a confirmed news that the new Google update is being rolled out and will soon show it’s widespread effects. It would be interesting to notice how websites are going to adjust themselves with the new Google’s signal and how they will tackle the impacts if they have been already hit by it. I will be keeping my eye on the effects and will keep posted about the findings.